Students and teachers have a lot on their plate. Teachers have to remember when report cards are due, when the school soccer team has practice and everything in between. Students on the other hand, ned to recall when their culminating assignments are due (for all of their classes) what evenings they work, have band practice and more. Needless to say, schools are extremely busy places filled with busy people! 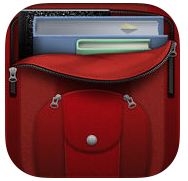 iHomework is an app that helps you remember important dates during the busy time of the school year. 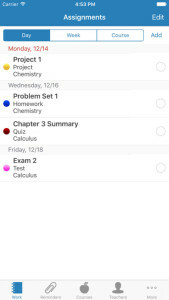 The app not only helps the user keep up-to-date with schoolwork, it reminds students of the grades they are receiving in their classes, their non-school related to-do lists, their teachers information (because we all know that the course syllabus magically disappears by the end of the semester/year), and really anything else the student needs to stay on top of during the school year. mark the location of your class so that you never forgot where you are meeting on any given day. This entry was posted in home communication, iTunes, organization, Tech Tool Tuesdays. Bookmark the permalink.